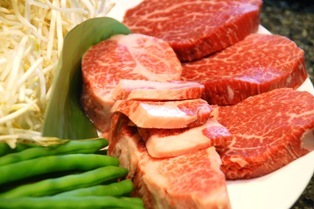 Yaki Wagyu Nigiri Zushi ('焼き和牛握り寿司', is classified into sushi), is known as Grilled Japanese Beef Nigiri Sushi in English, and 烤和牛肉 握寿司 (Kǎo héniúròu wò shòusī) in Chinese. It is the washoku. 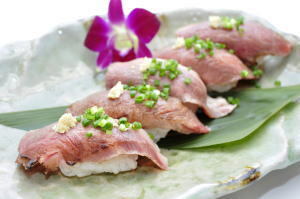 Yaki Wagyu Nigiri Zushi is a hand-formed sushi that set grilled Japanese beef on sushi rice. We can eat this dish at special sushi restaurants in Japan.